ColBear. Card Artwork. Monster Type: BEWARE THE COLBEAR! Beware the terror of terrors! The Unbeatable monster! The ColBear!!! Gaze upon the murderous maw of this depraved monster. Its sharp teeth. Its vicious chainsaw hands. Any adventurer who encounters the Colbear and dares to fight it, all have ended up in a grave; awaiting their rez spells. Should you confront the Colbear, relieve your bowels, pray to god, or gods, and hope that it makes your end quick. For he may be hungry, and then, your just ColBear poop. The Colbear was spawned while I was at work. There was a dry-erase board and some workers doodled on it. I went up there and made a series of doodles consisting of a Mothman with a Monocle, the Chupacabra drinking a beer, to a Bear with Chainsaw hands. 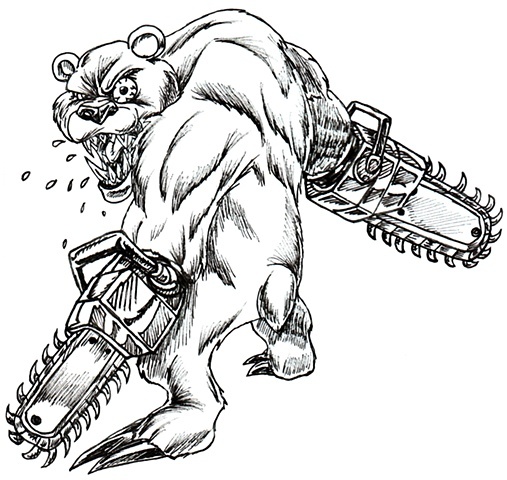 When I was laid off from the job, the picture stayed there for most of the year, and I played around with the idea of a chainsaw handed bear. When Nick, the primary co-creator of the game, asked me for some new card ideas, I pitched this one. It didn't have a name until Nick gave it the name ColBear, after comedian and avid Bearaphobic, Stephen Colbert. This one was the one picture I saved for last, as it is one of my personal favorites and one I intended to deliver the best work on it. So far, I feel confident in that I succeeded in its portrayal.